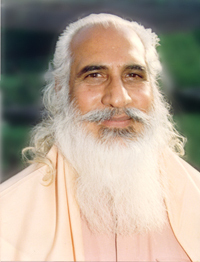 Shri Chandra Swamiji Udasin was born on the 5th of March, 1930, in the village of Bhuman Shah, district Montgomery, now in Pakistan. The village is named after Swamiji's beloved Master, revered Baba Bhuman Shahji, one of the greatest sages and mystics of the eighteenth century. From his early childhood, Swamiji has had a very intimate and mystical relationship with Babaji and he attributes all of his spiritual efforts and attainments to the latter's unreserved grace. In the year 1947, Mahanta Girdhari Dassji, the tenth master in the line of Baba Bhuman Shahji, initiated Swamiji into the much respected Udasin tradition of Hinduism. After initiation, Swamiji continued for some years with his studies and sports activities, in which he greatly excelled. However, the seeds of spirituality from many previous lives had already started sprouting. While he was pursuing his postgraduate studies in science, a very powerful longing for the Divine drove him to seek the first-hand and integral Realization of the Divine in this very life. Possessed by strong dispassion, he abandoned his Masters degree in mathematics, severed all worldly ties, and took sannyas to lead a monastic life. This was in the year 1952, when he was only twenty-two years old. A period of intense sadhana followed. He went to Jammu & Kashmir and spent about eight years there in a cave and on a sacred mountain in Srinagar. Then, from 1961 to 1970, he lived in a small thatched hut on a secluded forest island near Haridwar, on the banks of the holy river Ganges. It was there that he attained the highest and never-waning integral spiritual Realization. Many visitors going to his hut found they had encountered a truly realized soul. In 1970, at the earnest request of his devotees, he moved from the forested island to a small ashram on the bank of the Ganges, named Sevak Nivas, in Sapta Sarovar, Haridwar, where he lived for twenty years. As that area gradually became noisy and commercial, he constructed a new ashram in a more secluded place in the remote and hilly village of Domet, District Dehradun, Uttarakhand, on the banks of the holy river Yamuna. In October 1990, Swamiji moved to the partly constructed Sadhana Kendra Ashram, about 50 kms away from Dehradun. Inspired by God, Swamiji remained in unbroken silence from October, 1984 until August, 2017.